It’s been 19 years since David Dunn (Bruce Willis) survived a horrific Philadelphia train derailment that killed all onboard save for him and in the process discovered he had powers bordering on superhuman. In the time since he and his son Joseph (Spencer Treat Clark) have been secretly helping the city, stopping a variety of thugs and other reprobates from committing any more crimes. Meanwhile Elijah Price, a.k.a. 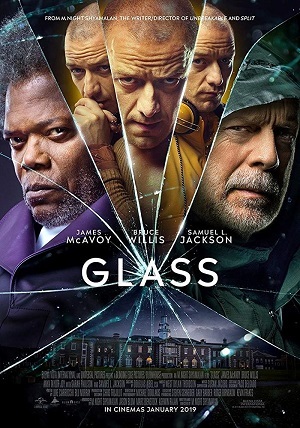 Mr. Glass (Samuel L. Jackson), the mastermind behind that train disaster as well as two other mass casualty acts of carnage, has been incarcerated in a mental institution, drugged into an indifferent stupor as the staff is terrified of his massive intelligence. Potentially worst of all, Kevin Wendall Crumb (James McAvoy), a man with over 20 different personalities nicknamed “The Horde” dwelling inside of him, has kidnapped four high school cheerleaders to feed to his most powerful persona “The Beast” as soon as this half-man/half-animal creature awakens once again from his slumber. David Dunn saves the cheerleaders from slaughter, stopping The Beast from consuming them. But in doing so the both of them are apprehended by Philadelphia police and placed in the custody of Dr. Ellie Staple (Sarah Paulson), a psychologist who specializes in the treatment of individuals who believe themselves to possess abilities like something out of a comic book. It is the same institution housing Elijah Price, and he’s nowhere near as catatonic as he has been letting on. With the arrival of Dr. Staple, and with her bringing David and Kevin/The Horde/The Beast with her, Elijah is finally ready to make a bold new move, his latest gambit pitting hero against villain in a lethal gladiatorial battle he wants the whole world to witness. It’s taken a while, but writer/director M. Night Shyamalan has finally completed his quest to deconstruct superhero comic book tropes down to the most basic elements, stripping them metaphorically naked as he does so. A story begun with 2000’s cult favorite Unbreakable and unexpectedly continued with 2016’s surprise box office smash Split, the filmmaker’s latest drama Glass is an unapologetically bleak affair. It is a slow, highly methodical evisceration of comic culture and expectations, refusing to bow to convention while at the same time still managing to follow the basic template of heroic fiction going all the way back to Greek Mythology. Shyamalan’s film is fearless in its minutia and does not appear to care if it warms the cockles of this series’ most ardent fans, the director’s latest bit of narrative sleight of hand oftentimes breathtaking to behold. Not that this trilogy capper is flawless. Far from it. Shyamalan has never been one to pace his films particularly well, his penchant for overblown melodramatic flourishes that seem to go on forever almost second to none. Additionally, while I get the feeling the dialogue is purposefully overblown and theatrically embellished, some of the long monologues delivered by both Dr. Staple and by Elijah can get a little silly, their trite overt artificiality frequently eye-rolling. I’m also not entirely certain David’s son Joseph, Elijah’s still devoted mother (Charlayne Woodard) and Casey Cook (Anya Taylor-Joy), the only girl to ever escape The Beast’s clutches, are all incorporated into the story as neatly as is comfortable. While they all have a major part to play, it’s never clear as to why they’ve all become so important other than the need for someone to bear witness to all that is happening, and while some might find that satisfying I still felt Shyamalan could have fleshed each character out a bit more than he actually does. But I was honestly fascinated by all that was happening throughout nonetheless. Whenever it sticks to its central scenario and allows Elijah’s plan to blossom organically, I was riveted with the breadth and depth of Shyamalan’s continued dissection of comic book mythology and culture. His story is a masterful continuation of the themes and ideas the filmmaker began to ponder in Unbreakable, the director still treating things with a level of austere sincerity that forces the viewer to reassess their own concepts of what internal facets makes a hero stand tall and what are the seeds that allow a villain to germinate and blossom into existence. Each step of this journey reveals levels of interconnectivity that purport that life is a constant battle of yin and yang with light and dark in a symbiotic struggle for supremacy that neither is destined to win. This will rub many the wrong way. Shyamalan’s point of view is both determinedly dour as well as being a wee bit pretentious. He presents his story with a level of haughty certitude that will undoubtedly make a lot of viewers angry, while the destination of his tale is overflowing in heartbreaking tragedy that’s shocking in its disdain for traditional superhero storytelling. Even the nuclei of companionship, forgiveness and hope that materialize at the end are laced with a gruesome emotional grisliness that’s resolutely uncomforting, the future world that’s theoretically being outlined one filled with pain and desolation as much as it is selflessness and optimism. As much as I enjoyed his last two low budget efforts The Visit and Split, from a technical standpoint Shyamalan is back at the top of his game in ways he hasn’t been close to in quite some time. There is a haunting visual elegance to this picture that’s incredible, cinematographer Mike Gioulakis (It Follows) doing a magnificent job crafting images that kept my eyes glued to the screen. Chris Trujillo’s (Nerve) production design and Jesse Rosenthal’s (Creed II) art direction are equally extraordinary, while composer West Dylan Thordson (Joy) does a fine job reworking James Newton Howard’s signature themes from Unbreakable while also incorporating them into his own compositions for Split and in the process brings to a life a score that is viscerally unique in ways that fit this film perfectly. As I’ve already stated, it’s likely audiences on the whole are going to be disappointed in Glass. They are going to enter the theatre anticipating Shyamalan to go in a certain direction where he pits his characters against one another in a traditional manner only to have him shatter those expectations while at the same time pointing a finger back their way asking them to reassess their understanding of the psychological dynamics that separate good from evil. Personally, I was transfixed by a lot of this, felt this story followed in the footsteps of Unbreakable and Split marvelously. For me, Shyamalan’s brutally self-aware conclusion to his trilogy was well worth the wait, and I’ll be curious to see how this series ends up getting assessed, debated and reinterpreted over the next few years.